Finally! A good three and a half years since Ben originally got me this kit it’s finally done, and what a monster it is! Compared to other 1/144 models it’s a goliath, the MG must be insanely huge! Detailing on this model is fantastic, loads of panel lines – not hard to top my last kit (MG RX78 V 2.0). I used a Gundam Pencil to fill these in(personally I like soft grey panel lines of Gundams as black contrasts too heavily with the white panellling). The kit required a little bit of painting to finish it off, just minor detailings like the chest vents, head cannons & inside the shoulder boosters. Have to admit i did use some of the stickers that came with the kit for the yellow shoulder stripes and shield emblem, but they actually laid on surprisingly well. As far as moving parts and other details go, skirts all move, and the side skirts contain holes for 2 beam sabers. The shoulder booster ends pivot out to reveal an extra booster on each side, these parts are all connected and look awesome as they’re deploying in unision. All the points of articulation you’d expect are here, head, waist, shoulders, elbows & considering the size articulation is surprisingly good. Obviously you’ll never get it doing the moves of the HG 00 but it hasn’t disappointed me yet. The chunky feet are composed of 2 independent parts and this allows for very free posing, especially considering the chunkiness. Shoulder boosters pivot up and down, and can also swin forwards or backwars, they do tend to fall off as youre moving they though as they’re held on by a single polycap. 2 x Beam sabers – Curiously this model comes with 2 clear green saber cores but the GP01FB comes with a single hard modled white beam saber which needs paiting for full effect. Atomic Bazooka – Comes in 2 parts which connect together, has a slide-out targeting reticule. Brilliant kit, working on the GP01FB so they can be displayed on their dual stand and begin their eternal battle! I’m sorry. I made a mistake in a mail address. It’s a beast! 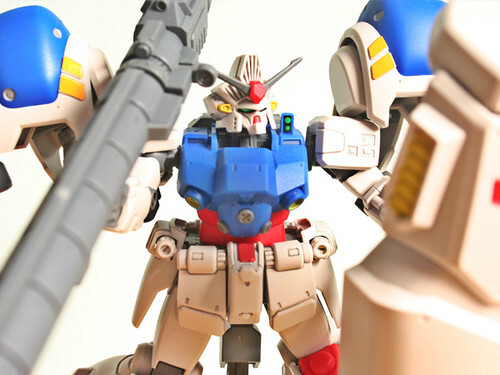 The Nuclear Hyper Bazooka in1/144 scale is still bigger than the MG RX78’s 1/100 Bazooka! I’m working on the GP01 at the moment and it’s tiny in comparison. You’re telling me, can’t wait for the Unicorn movie!